Zabaglione, that elegant creamy froth of egg yolks, sugar, and wine, is both comfort and party food. Francesco suggests that mastering the technique of whipping up zabaglione allows the cook to have a last-minute dessert on hand at all times. 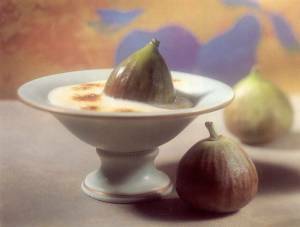 “You have eggs, you have sugar, and a little wine, so you put it over what fruit you have and serve it hot or chill it or even broil it to give it a nice finish.” Even though plump fresh figs in season need no adornment, they become delectably lush under a mantle of zabaglione. This zabaglione is made Venetian-style with sparkling prosecco, not marsala. It can also be served with a whole fig placed in each dish. Select a metal bowl that will fit cradled in a saucepan without falling in, to improvise a double boiler. Do not use a standard double boiler because the container should have a founded bottom. Place the egg yolks in the bowl, add the sugar, and beat with a whisk or a hand-held mixer until they become frothy. Beat in the prosecco. Fill the saucepan with water to a level just below the bottom of the bowl, bring to a simmer, and place the bowl in the saucepan. Continue beating as the mixture gradually warms and keep beating until it turns light and very thick, about 10 minutes. It should be cooked enough so it is fairly warm with steam barely beginning to rise from it, but be careful not to overheat or you will have scrambled eggs. Remove the bowl from the heat, place it in another bowl filled with ice, and continue beating until the mixture is cold. Fold in the whipped cream and refrigerate it. Just before serving, preheat a broiler. Spread the chopped figs in 8 individual shallow baking dishes. 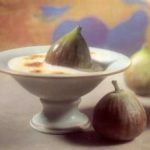 Spread the zabaglione over the figs. Place under the broiler and broil until the top is golden brown and glazed. If desired, add whole figs before serving. Serve at once.